Over millions of years carbon still undergoes constant cycling and recycling via the short-term cycle, but added to this is a new set of processes affecting carbon. This is the long-term carbon cycle, the subject of this book. What distinguishes the long-term carbon cycle from the short-term cycle is the transfer of carbon to and from rocks. This is illustrated in figure 1.2. Over millions of years carbon transfers to and from rocks can result in changes in atmospheric CO2 that cannot be attained via the short-term carbon cycle. This is because there is so much more carbon in rocks than there is in the oceans, atmosphere, biosphere, and soils combined (table 1.1). The maximum change in atmospheric CO2 that could be obtained, for example by burning all terrestrial life and equilibrating the resulting CO2 with the oceans, would be less than a 25% increase from the present level (Berner, 1989). In contrast, changes in the long-term carbon cycle have likely resulted in past increases in atmospheric CO2 to levels more than 10 times the present levels, resulting in intense global warming (Crowley and Berner, 2001). Table 1.1. Masses of carbon involved in both the short-term (prehuman) and long-term carbon cycles compared with some fluxes in the long-term cycle. Modified from Berner (1989, 1991). 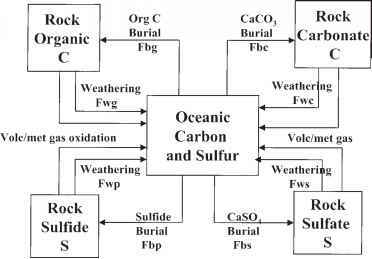 This is a key reaction of the long-term carbon cycle and represents the transfer of carbon from the atmosphere to the rock record by means of weathering and marine carbonate sedimentation. The reaction was first deduced by Ebelmen (1845)1 and much later by Urey (1952). It can just as well be written in terms of Mg and Ca-Mg silicates and carbonates. In this book the reaction will be referred to as the Ebelmen-Urey reaction. Only the weathering of Ca and Mg silicates is important; weathering of Na and K silicates does not lead to loss of CO2 because these elements do not form common carbonate minerals in sediments. (The CO2 consumed during Na and K silicate weathering is returned to the atmosphere during the formation of new Na and K silicates in sediments; see Mackenzie and Garrels, 1966). Also, weathering of Mg silicates does not necessitate the formation of Mg-containing carbonates. The dissolved Mg from silicate weathering, when delivered to the oceans, is well known to undergo a series of different reactions with submarine basalts that results in the liberation of Ca that is precipitated as CaCO3 (Berner and Berner, 1996). Reaction (1.5) represents decarbonation via volcanism, metamorphism, and diagenesis, and together reactions (1.4) and (1.5) and their magnesium silicate and carbonate analogues constitute the silicate-carbonate subcycle. This "reverse" reaction was also adduced by Ebelmen and Urey. Reactions (1.1) to (1.5) are used to simplify representation of the silicate-carbonate subcycle. In reality weathering involves Ca and Mg alu-minosilicates, such as calcic plagioclase, with aluminum precipitated as clay minerals. The clay minerals are then involved in reactions with calcium carbonate or dolomite to form igneous and metamorphic (and even diagenetic) silicates. But the overall principal of CO2 uptake and realease is the same as represented by reactions (1.1)-(1.5). 1. J.J. Ebelmen, more than 100 years ahead of his time, deduced correctly almost all of the major long-term processes affecting atmospheric CO2 and O2, including volcanism, the role of plants in weathering, the weathering and burial of organic matter and pyrite, and the weathering of basalt (Berner and Maasch, 1996). This is the reverse of reaction (1.2) for the precipitation of CaCO3 in the oceans. Thus, the weathering of CaCO3, followed by transport of Ca++ and HCO 3 to the oceans and the precipitation of new CaCO3, results in no net change in atmospheric CO2. On shorter time scales (e.g., stages of the Pleistocene epoch), weathering of carbonates can be greater than, or less than, their precipitation from the oceans, with the excess carbon stored in or lost from seawater. However, over millions of years the necessary storage or loss becomes so excessive (the mean residence time for bicarbonate in the oceans is about 100,000 years; see Holland, 1978) that purely inorganic precipitation will occur or carbonate sediments cannot form. There is little evidence that such extreme conditions have ever occurred during the Phanerozoic which is marked by continuous deposition of limestones rich in biogenic skeletal debris (e.g., Stanley, 1999). 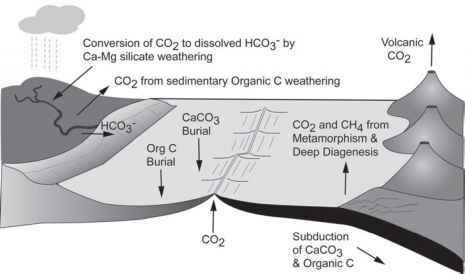 That the weathering of carbonates has no direct effect on atmospheric CO2 does not mean that this process can be ignored in studying the long-term carbon cycle. This is because it is necessary to account for all sinks and sources of carbon, and carbonate weathering supplies carbon for transport from minerals to the oceans. (Note that in reaction 1.6 there are two bicarbonate ions produced from calcium carbonate weathering and that one of them comes from the carbon contained within the carbonate mineral itself.) Modeling of the long-term cycle involves calculation of the rate of Ca and Mg silicate weathering, and this requires a knowledge of the rates of Ca and Mg carbonate weathering (Fwc in equation 1.13 below). which together sum to reaction (1.8). A special example of reaction (1.8) is the burning of fossil fuels by humans. Coal and oil are concentrated forms of sedimentary organic matter. Under natural processes the coal and oil is slowly oxidized by weathering and thermal degassing of hydrocarbons as mentioned above. However, humans have extracted these substances from the ground so quickly, from a geological perspective, that oxidation of the carbon occurs at a rate about 100 times faster than what would occur naturally. As a result the long-term carbon cycle impinges on the short-term cycle, and this has led to an extremely fast historic rise in atmospheric CO2 (IPCC, 2001). 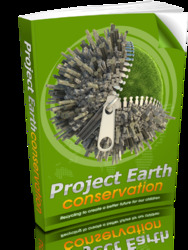 What are the longterm processes that transfer carbon to atmosphere? What is long term carbon cycle? What is the shortterm carbon cycle? Why is there so much carbon in rocks? What is long term and short term carbon cycle? How does carbon go through longterm cycling? Is global warming a short term cycle? What happens to carbon on the Longterm carbon cycld? What is the long term process of the carbon cycle? What is the longterm for carbon cycle? What is long tem outlook for the carbon cycle? What is the long term outlook for carbon cycle? What is the short term cycle of carbon oxgygen cycle? What is the longterm process of the carbon cycle? What is long term inorganic cycle?